Your goal may be that you need to lose some weight or perhaps you want to qualify for Boston. Oftentimes many people fail to achieve their goals not because they lack talent, but because they can’t stay motivated to train and they ultimately quit. I’ve coached a few busy athletes who purchase a plan with the best of intentions, but after a few weeks, they simply disappear. Motivation is one of the biggest challenges faced by athletes. In this article, I’ll show you some proven strategies to get started and maintain your schedule of working out & training for a race. You don’t need to get caught up overthinking thinking, taking action is easier than you think. I’ve been there myself when I was plagued by injuries. I’ve also coached many runners who fall into this category. In this article, I will discuss how you can make a change. The following three steps are a proven strategy to help you Stop Thinking and Start Doing! Start by defining your priorities. What do you want to achieve the most? Think of this step as defining your “why.” You want to feel connected to what you’re doing. It’s not just setting a goal, but it’s having clarity for why the goal is important. Some examples may be losing some weight or simply improving your health. You might want to run in a race to raise money for a cause that’s important to you. Your why might be setting a Personal Record in a certain race or distance because you want to challenge yourself and improve upon previous performances. One strategy I use to help stay motivated anytime I’m thinking of skipping a planned workout, is to think of my “why.” If it’s really important I know that I’ll figure out how to get out and complete the workout. If you have a goal that you really want to reach, focusing on the end result (or your why) is a great strategy to help keep you on track. Think of it as giving you a purpose to do what is needed to meet the objective. This strategy is particularly helpful if you’re running to improve your health. If you feel that your health is not where you want it, then you must “pivot” and do something different. Think about what your life may be like if you don’t lose weight or improve your health. Consider the effect on your family if your health were to decline significantly. Using this strategy is an excellent way to maintain your discipline. Stress is a big factor if you’re having problems staying disciplined and on track to meet your goals. Identifying the root cause of your stress is the first step in minimizing it’s effect on your ability to follow your game plan. Whether it’s work or family related stress, it’s essential to determine how you can reduce this stress, so you can workout. It might just be that running and/or exercise are the best ways to reduce your stress. Some people like to run in the morning, so they don’t have to stress about it later in the day. Other people like to run later in the afternoon as a way to reduce the stress that’s built up during the day. Regardless, once you figure out how to reduce stress, you will have a much easier time concentrating on the accomplishing your goals. Try to find a way to hold yourself accountable for whatever activity or goal for which you’re trying to stay disciplined. If your “why” is connected to a running goal, I recommend setting both short and long-term goals. It’s important to set specific goals that are consistent with your athletic abilities and your specific situation. The long term goal can be a stretch goal, but the short term goals should be realistic and align with the long term goal. All goals should not only be specific, but measurable with some kind of time to completion. You can start with the long term goal and walk backwards with goals and/or steps necessary to ensure your success. One caution is to set realistic goals. 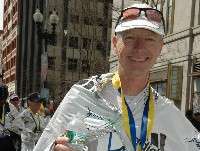 Qualifying for the Boston Marathon might be a big stretch if you just started to run. This could be a great long term goal, but it’s more likely that you’ll be more successful by starting small with something like working out 3-4 times per week and then completing a 5k. Give yourself due dates for each of these goals, but don’t get discouraged if you can’t achieve everything as planned. If you’re better off than when you started, then celebrate the progress. Don’t train on your own, let me help. 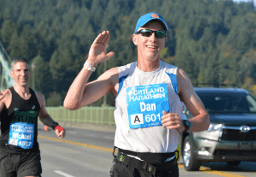 Achieve your best performance with a personalized Crushing 26.2 “middle age marathoner” training plan. This is one of the best strategies to accomplishing your goals. Start by identifying small next steps that are “next to impossible” for you not to complete. Every small act is significant. There’s an old saying that may help you better understand this concept, “you can’t eat an elephant in one bite.” What can you do right now to take even the smallest step towards achieving your most important goal? Following along the previous step, sometimes when a goal seems too big to tackle, this puts up barriers in our mind. These barriers often prevent us from reaching our intended results. Try using subtasks or “small bites” to make the long term goal more manageable. As you think about your sub tasks or what you can do next, hold the expectation that the answer will be something simple that can be done in the next 30 minutes or less. Whatever reasonable answer pops into your head, accept it and act on it immediately. Once you commit to getting started, momentum carries you. Producing results builds positive momentum. With momentum you’ll get ahead and make progress much faster. 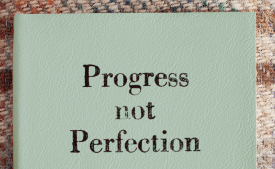 It’s also essential to look at your progress. If your goal was to lose 20 lbs while getting in shape to run a local 5 or 10k race and on race day you lost 14 lbs, celebrate your progress. It should easily be enough to keep you going because you’re now over half way to our weight loss goal. In addition to the weight you have already lost, my guess is that you have also lost inches off your waist. When you finish the race, you will also feel very accomplished. When you regularly workout with others it can really help you to stay disciplined. Many local gyms have running groups that meet 2-3 times per week. Many races also sponsor group training where runners meet regularly to complete longer runs and harder track workouts together. It’s like having a support group that holds you accountable and keeps your motivated. If you’re able to complete your workouts on your own, but your challenge is you’re not sure what to do to prepare for a race, then a coach can help. You can join a group that has a coach who will help 5-15 people who are training for the same race. Alternatively, you can pay for a coach to write up a custom training plan that uses the athlete’s input and is specific to their goals and athletic abilities. Some coaches allow you to schedule specific workouts to fit your weekly schedule. This is a nice feature, but what’s equally important is showing the athlete how to make adjustments to the schedule when they miss a workout. For example, many people schedule their long runs for the weekend. However, if you had a preference for another day of the week, a coach could adapt the schedule to fit your needs. If you desire regular interaction with a coach in addition to a custom plan, then personalized coaching may be the best solution for your needs. These plans are more expensive, but they provide the ability for instant feedback and to ask questions. I offer a very affordable monthly plan or a discounted 5 month plan that’s perfect for anyone who has signed up for a race, like a marathon, that’s 4-5 months out. Psychologists advise us to stay positive for a good reason. A negative attitude fuels fear and anxiety, keeping you from reaching your goals. You always think of what could go wrong instead of keeping an open mind. Keeping a positive attitude is good for your health too. It boosts your motivation and inner drive, helps you stay strong when times get tough and gives you a fresh perspective on the world around you.